The Web Equipment, Naval, Pattern 1919 Waist belt was introduced with the Pattern 1919 Naval Web Equipment in List of Changes L. of C. §23254, dated 2nd October 1919. The introduction of this three part, 2-inch wide Belt was the first time that the Mills "Back Adjustment" Waist belt was made a part of British Military Equipment. This system was first developed by M.E. Co. around 1911, and was used in some web equipments sold to European customers. The Canadian Web Equipment, Pattern 1913, used a very similar Back adjustment strap, but without the side pieces which made it usable as a stand-alone Belt. That Web Equipment had a completely separate single piece Walking out belt instead. The Pattern 1919 Naval Web Equipment adopted the Mills system in total, using the Back adjustment strap with Cartridge carriers in the Rifle Equipment, and with the two 2-inch side pieces in the Officers and Naval Pistol Equipments. See the Rifle Equipment page for pictures of the W.E. Patt. '19 Back adjustment strap. In this example, the Back adjustment strap is dated 1923, but the Side pieces are dyed a lighter colour and are of later manufacture (1939). From the Karkee Web Collection. The Web Equipment, Naval, Pattern 1919 Braces were introduced with the Pattern 1919 Naval Web Equipment in List of Changes entry L. of C. §23254, dated 2nd October 1919. This was the first use of the Mills reduction weave braces in the British military, although almost identical Braces were used in the Canadian Web Equipment, Pattern 1913. The same type of Braces would continue to be used by the Web Equipment, Pattern 1925, and by the Web Equipment Pattern 1937 until mid-1940. Each Brace is 1-inch wide web, widening to 2-inches for about 18-inches in the middle. These examples are maker marked "M.E. Co." and dated 1920 (left) and 1923 (right). From the Karkee Web Collection. This picture shows a detail of the inside of the left Brace, illustrating the "cross-over loop." The end of the Brace with this loop is attached to the left buckle on the Back adjustment strap, and the end of the right Brace passes through it before being attached to the right buckle on the Back adjustment strap. In this picture you can see both the "BROAD ARROW" over "N" over [number] Naval Inspection Stamp and the maker's mark and date. The Web Equipment, Naval, Pattern 1919 Brace attachments were introduced with the Pattern 1919 Naval Web Equipment in List of Changes L. of C. §23254, dated 2nd October 1919. 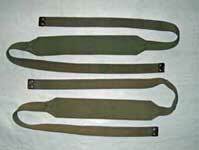 The Brace attachments are used to attach the Braces to the Waist belt in the Officer's and Naval Pistol Equipments. The Braces are attached to the Cartridge carriers in the Rifle Equipment. As originally introduced, the two web parts of the Brace Attachment were connected by a round brass loop. List of Changes entry L. of C. §A4174, dated 27th November 1928, replaced the loop with the rectangular fitting, creating the type later used with Web Equipment, Pattern 1937. This pair is broad arrow "N" naval marked, maker marked "M.E. Co." and dated 1924. From the Chris Pollendine Collection, photographs © Chris Pollendine 2011. This example is maker marked "M.E. Co." and dated 1929. The 1929 date is interesting, because it is just after the acceptance date of L. of C. §A4174, which replaced the brass loops with rectangular fittings. Perhaps they were using up old stock! This Brace attachment is from the personal collection of John Cameron, Webmaster of the Canadian Military Police Virtual Museum. Photographs © John Cameron 2008. An example of the 2nd issue W.E. Pattern 1919 Brace attachment, as authorised by List of Changes L. of C. §A4174. The change from a round loop to a rectangular link is an example of "lean manufacturing" - a link can be stamped from brass in one step, whilst a loop must be formed from wire and soldered. This Brace attachment is maker marked "M.E. Co." and dated 1930. It is also naval "N" and broad arrow marked. Photos used by kind permission of JRW Collectables. These two Brace attachments conform to the W.E. Patt. '19 1st issue specification, more-or-less, but they were clearly not made by the Mills Equipment Company. The brass fittings are crudely sand cast, and the sewing is rough and uneven. Neither Brace attachment is dated nor has a full set of clear markings, but just recently we've seen a pair of 1924 dated Patt. '08 Supporting straps from this same manufacturer. We can now confirm that the maker's mark reads "Q-H.F.G. Ltd" over "OTTAWA". Best guess at this point is that these are locally made copies, but any information on these would be appreciated. The example on the left is from the John Cameron collection, © John Cameron 2008; the one on the right is from the Karkee Web collection. The Web Equipment, Naval, Pattern 1919 Haversack straps were introduced with the Pattern 1919 Naval Web Equipment in List of Changes L. of C. §23254, dated 2nd October 1919. These web straps are 3/4-inch wide by 13-inches long, with a brass tab on one end and a rectangular loop on the other. They are used to support the Pattern 1919 Haversack from the Brace attachments when the Haversack is worn on the back. At other times they are carried strapped to the bottom of the Haversack. The photo far left, of a sealed working pattern of the Haversack strap, is from the Carl Woods collection, photograph © Carl Woods 2008. The photo near left, of a pair of Straps, is from the John Lamont Collection, photograph © John Lamont 2010. It is interesting to note that, although both examples are undoubtably genuine, they have different styles of brass loops. None of these Straps is maker marked or dated, although all three were almost certainly made by M.E. Co. The pair is associated with an early, 1920 dated Patt. '19 Haversack, and so may represent the earlier variation. See the W.E. Pattern 1919 Haversacks and Packs page for details and pictures of the Straps in use with the Haversack.